This is Grissom, our newest family member. Hubby and I are huge CSI fans and Grissom seems to like to investigate so the name is fitting. This is Riley. She is a Netherlands Dwarf bunny. She is almost 6 1/2 but the vet cannot believe it. She's very healthy and fit as she eats all fresh food and runs up and down the stairs of our house quicker than most people! 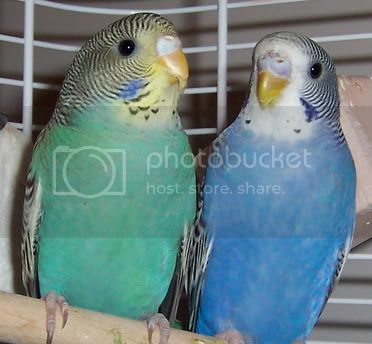 Abby (dressed in green) and Gracie (in the blue outfit) are our 3 month old budgies. They are very bonded to each other and spend the day grooming each other and playing. They enjoy listening to classical music when we are at work. Well, that's our family. Pretty cute eh? What a great looking family you have Grissom's mom. We look forward to seeing more family pics in future. Oh so cute! What a happy little family! What a pretty family you have there! What a beautiful puppy, he looks so cuddly and sweet. Now who can resist puppies? Not me! "There are people who reshape the world by force or argument but the cat just lies there, dozing, and the world quietly reshapes itself to suit his comfort and convenience." Hi there. Yes, Grissom is a smooth coat chihuahua. The breeder tells me that their dogs average 3-5 lbs. Riley is 3 pounds so it will be nice that they will be nearly the same size. I hope they become good friends. Riley is a little set in her ways but I'm sure she'll find Grissom interesting. Abby and Gracie are a bit snobby and prefer to stick together. I will be interesting to see their reaction when we bring Gris home! Very nice looking family and cant wait to see more pics as Grissom grows also one of my favourite shows. Such cute "kids" you have!! Grissom is adorable! CSI is also my favourite show. I watch it everyday at 7 & 8 on Spike TV! Very cute family, I love the little puppy. Gorgeous family you have. So precious. I can't resist puppies either... I'm w/ baby animals like most women are w/ babies (humans) , I can't resist holding them!!!!!!! On another note- I noticed the bunny is in the house, am I right? Can you explain potty training a bunny? I've got cat training down, but never tried w/ a bunny... Don't have one, but think it would be very cool to have one in the house.... See it & a couple of cats cuddle up together... AWWWWW! hddlstn02, Riley was actually pretty east to train. When I got her as a baby, I kept her in her pen unless I was home so she would poopie there. When I let her out, if she had an accident on the floor I would clean it up in front of her with a paper towel while she was there and tell her "poopie in the poopie cage" and put the soiled towels in the litter box. After about a week she got the idea and has done it ever since. Not to say that she didn't have accidents from time to time but 99.99% of the time she gets it right. She has been a 'free range bunny' her whole life - that is, she roams the house. My hubby built a pen for her (21 sq ft) and that is her home base with litter box, food dishes, etc. When she reached sexual maturity, that was about 2 months of following her around because she would try to mark areas looking for a boyfriend. That has been the only issue in 6 1/2 years. A bunny is a fantastic pet... as long as you protect your electrical wires. Awww.... Grissom is adorable. What a sweet little thing. 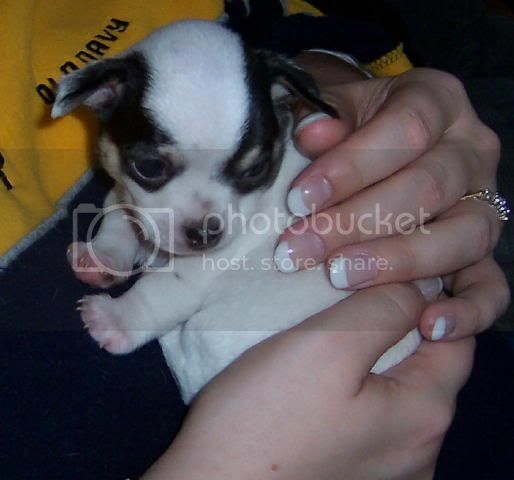 Your puppy is amazing, :love: as well as the other family members. Again, back to the bunny, does it chew your furniture? How do you think they get along with cats? What a lovely family of animal companions you have - the are adorable! Nice fur-family! Do feathers count as fur? Whatever! Riley does not chew furniture. She has a collection of cardboard boxes and if we don't watch it, she occasionally claims items as her chew toys (Example, a straw bag left on my closet floor, oops. 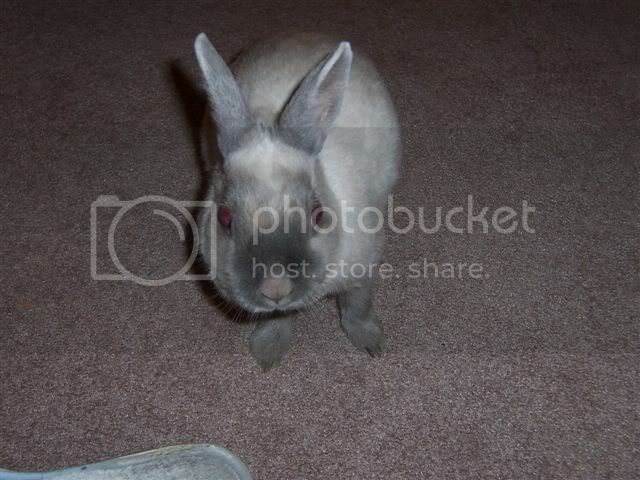 She did like cords and wires when she was younger so I had to bunny proof but she is a great pet. Love the pix, espcially the bunny. And 6 1/2 is no longer that old among bunnies. My late beloved bun died at 13 and up until his last iillness, he was running up and down stairs, jumping into my bed (which is high!) and hopping around like crazy. The last two years, he had arthritis and sometimes needed help to get to places - like his litterbox - but it did not happen that often. He was remarkably agile. So I am sure you will have many more years of fun with your bunny. They are all cute! Thx for sharing! Thanks for letting me know how to potty train rabbits... I'm sorry it took me so long to reply.